This week's Let's Get Real Monday theme is The Five Senses - See, Hear, Smell, Taste, and Feel. See - My almost 6 month old baby girl rolling over by herself for the very first time on Friday. Hear - My 2 year old talking more and more and imitating words, expressions and tones of voices. My favourite of the weekend was him quoting his Uncle Andrew Sunday afternoon, "No man!" Smell - Freshly cut grass. I mowed the dandelion jungle lawn Sunday evening. I love mowing the lawn. Really. I do. :) Our riding mower is across the river at a friend's cabin so I borrowed my dad's push mower. It was a little nostalgic for me as I used the same lawn mower to mow our family's lawn when I was a teenager! Taste - The delicious dessert spread my husband and I got to sample Sunday night. We had a little date and went to a fundraising event called "Just Desserts". I skipped supper and just went straight for a pile of desserts. Mmmnn! Feel - Dirt on my face, my feet, in my hair, and under my fingernails. Hendrik and I started weeding our community garden plot on Saturday afternoon. 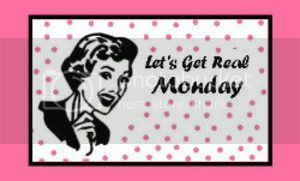 Head over to Randi's blog for more Let's Get Real Monday links. Let ' s Get Real Monday - " The Outfit "
This week's theme over at Randi's is "The Outfit". Here are two of my former faves! C) Or were really glad to have someone to make fun of! I had friends comment that they couldn't lose me in a large crowd but by wearing that jacket they might just hide from me! LOL! CONFESSION: I still own both pieces of clothing. I actually tried them on tonight to get pictures. I think it's time to say goodbye! It's time for "Let's Get Real Monday" with Randi over at i have to say... This time the topic is "My Favorite Things". Zip over to her blog and check in on everyone's favorites and add your own! checking Bloglines for new posts from the blogs I visit regularly! I've decided to be brave and join Randi at i have to say for "Let's Get Real Monday". Here's the idea: "Pick your own must-be-cleaned spot (or spots) in your house and post them on your blog (posts with or without pictures are perfect!). Then leave your link in my Monday post so that myself and the other gals can come visit you!" Here is the laundry area/coat storage in our apartment. It's too cluttered for my liking but I just haven't worked out a good storage system yet. This is the area to right in the picture above. It is our only real extra storage space so out of season clothes, recycling, shoes and more shoes, boots, sporting goods, luggage, stuff to be donated, fans/airconditioner not in use, baby bath tub, tools, they all wind up here. Scary. I know.